（2016年4月號480期動腦雜誌）Only a few years ago ad agencies in Taiwan faced a daunting change in digitization, and most of the industry has now been transformed. Standing tall with a totally new look, they are leading clients into the future. Michael Hsu, Former Chairman of the Taipei Association of Advertising Agencies, told participants at a Brain Magazine-organized forum that most medium and large ad agencies in Taiwan experienced a growth in their gross income ranging from 5% to 15% in 2015 compared to the previous year. This came partly through the signing of additional clients as well as significant gains in performance. The improved performance owed a lot to the incorporation of digital technology, and in most cases it resulted in stronger ties between agencies and their clients. Hsu pointed out that 2015 brought a sweeping change in attitudes among leading ad agencies regarding the role of digital media tools, with creative, account and media types all moving on from resistance to digitization to reluctant acceptance, and eventually to actively embracing the technology. The result is being heralded as a “new era in advertising”. 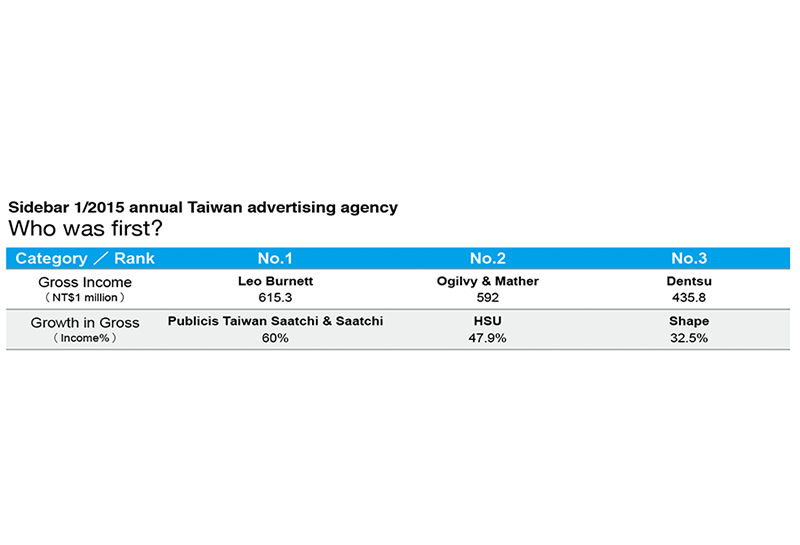 According to Brain Magazine’s Comprehensive Ranking of Taiwan Advertising Agencies for 2015 (page 84), the 35 top agencies reported a total gross revenue of NT$7.736 billion, a jump of 7.09% from the NT$7.224 billion racked up in 2014. Little change was seen in the rankings line-up for 2015 based on gross earnings. Leo Burnett stood in first place with a solid stable of blue-chip clients including McDonald's, Mitsubishi Motors, Taiwan Samsung Electronics and others, with earnings of NT$615.3 million. In second was Ogilvy & Mather, whose “Little Drummer” documentary-style online advertising for Cathay Holdings touched the hearts of millions of people and helped the agency realize a growth in earnings of 4% to NT$592 million. One outstanding performer during the year was Dentsu, which saw its gross income soar by 15.62% to put it securely in third place. On the other hand the United Group, made up primarily of United Advertising and Uni-Smart Advertising, slipped to fourth with a 15.36% drop in earnings, due mostly to budget cutbacks by clients. In fifth was J. Walter Thompson, a scant NT$3.57 million behind the United Group. 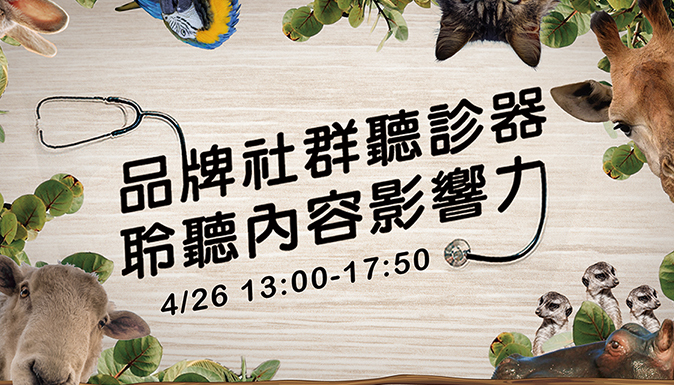 Once advertising agencies in Taiwan broached the barriers of digital technology they found it refreshingly easy to expand the reach of their advertising effectiveness to distant parts of the globe through Internet advertising. Jennifer Tang, Managing Director of Ogilvy & Mather, explains that digital production means the agency can develop campaigns for publication and broadcast mainly in Taiwan and quickly adapt them to use on YouTube and other online platforms to disseminate them to target all over the world. At the same time, however, agencies must be sensitive to the fact that moving into a wider media environment entails anticipating consumer habits and preferences in other markets. The agency must deliver creative products that meet the requirements across all platforms (the Platform Idea) in order to achieve maximum results. Yves Huang, Chairman of IAA and CEO of Shape, reminds brand managers that as advertising eases into the all-digital era, it is imperative to understand the brand from the consumer's point of view. One way to do this is to develop ads that combine storytelling and entertainment in order to catch and hold the attention of consumers and get them to watch ads all the way to the end. And even better, the ads will cause viewers to actively search for relevant information after seeing an ad, or share a newly-discovered online advertising with friends via cell phone to generate greater advertising effectiveness. The open media environment also means more intensive competition for brands in the market. Evan Teng, Managing Director of JWT and the newly-elected Chairman of the Association of Advertising Agencies, points out that directors of advertising agencies must ensure that personnel developing digital products must be acutely aware of four factors in digital advertising. First and foremost is digital planning: they must be familiar with the ways consumers interact with digital media during the course of a day. Second is creative force, the ability to come up quickly with ideas that resonate in the digital environment. The third factor is analysis, the ability to look at consumer data and see how it relates to the digital environment in order to put together advertising materials that will speak to target audiences in ways that convey a re-optimized image of the brand. Finally, advertising staffs must know the strengths of science and technology in order to make good use of emerging technology tools. Teng also notes three essential skills that advertising agencies will use extensively in the future: rapid response capability, digital analysis capabilities and the ability to optimize brands. In the past the main criteria for judging whether an ad is good or bad centered on its effect on the sales channel; now, however, in the digital environment it is possible to launch an ad campaign on the Internet and get almost instantaneous feedback from end users. This means that digital-savvy ad agencies can integrate and correlate their actions with media resources to maximize the benefits of clients’ advertising efforts. Advertising agencies with a few years of digital experience under their belts recognize that digital technology is in essence just another tool that can be used to solve customer problems. It is still necessary to look to the brand's core values, goals and ideas to develop basic policies for the brand, and once that has been done, to take advantage of available digital tools in order to achieve the objectives of the client. Advertising is still very much a people-driven industry, and the people creating and disseminating advertising have a profound effect on the ultimate value of the campaigns they design. Vivian Chang, Chief Creative Officer and Acting General Manager for Uni-Surf Digital Marketing at the United Group, urges agency personnel to review the way they view advertising. She points out that agencies executives who are mired in old concepts and outdated ways of thinking will still rely on old business models, and even if a whole new slate of talent versed in digital technology and alert to new methods is brought in the company will still have problems shifting into digital mode. Digital is the future, notes Chang, and agencies must take the initiative to embrace it while opportunities are still unfolding. Given Taiwan’s social environment, many agency executives still hold a generally pessimistic view of the economy and picture themselves as facing many challenges in the months to come. Leslie Chang, Chief Strategy Officer at Leo Burnett, sees 2016 as a ‘black swan’ year, meaning a period with many unpredictable events in store. Chang believes the overall market environment will continue to be volatile. He reminds agency heads that when consumers encounter changes in the marketing and sales channels for brands, advertising agencies must adjust their creative output accordingly. Advertising personnel must always be in tune with the market and alert to any changes rather than trudging along in an unchanging mode of operation. Gary Chi, Chairman of The Association of Accredited Advertising Agents of Taipei R.O.C. and Managing Director of McCann-Erickson Worldwide Taiwan, notes that brand needs will always exist and there will always be a place for advertising. At the same time, he says, precise targeting and integrated efforts will become more and more important for both clients and agencies in the future. Following the initial onslaught of the first wave of the digital tsunami, many advertising agencies found themselves feeling brand new, and they have enjoyed the fruits of restructuring over the past few years; eventually, however, the burden on agencies’ budgets must gradually be passed on to consumers, and everyone involved in digital advertising cannot afford to take the situation lightly. They must maintain a certain flexibility and explore and utilize different channels to obtain information in order to anticipate the next big round of wind and waves before it arrives. 動腦傳播股份有限公司 版權所有，轉載必究 Copyright ©Brain Communications Co., Ltd. All rights reserved.